As an avid podcast listener, I've been hankering for a return the world of audio conversations. What always trips me up is the amount of time it takes to accomplish "post-production" on podcasts. So I've decided to forego complications and simply try to record a weekly Facebook Live conversation that will be shared "as is", stumbles and all. Today's interview with my dear friend Maria Morera Johnson is the first of what I hope will be many such chats. The occasion for our visit is the launch of Maria's awesome new book Super Girls and Halos: My Companions on the Quest for Truth, Justice, and Heroic Virtue. But as you'll discover when you watch or listen to this episode, any chance to talk with Maria is simply a fun visit with a dear friend. 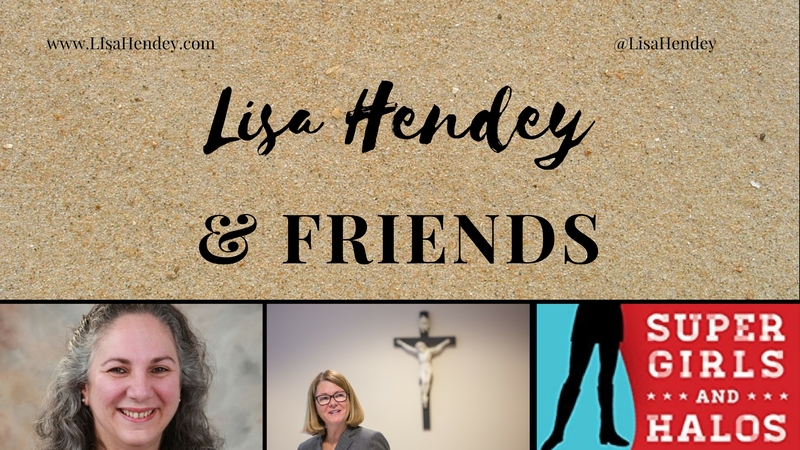 Who would you like to hear next on Lisa Hendey and Friends? Leave a suggestion here, send me a note on social media or email lisahendey@gmail.com! Lisa M. Hendey is the founder of CatholicMom.com and the bestselling author of The Grace of Yes, The Catholic Mom's Prayer Companion, The Handbook for Catholic Moms and A Book of Saints for Catholic Moms. Lisa’s newest project, the “Chime Travelers” fiction for elementary school readers, is based upon the lives of the saints. Lisa loves speaking to parishes, groups and schools. To invite her for a visit, email her at lisahendey@gmail.com. When you make a purchase using Lisa's Amazon links, she earns a small commission on your order. Thank you for your support!